I took this picture about a month ago. Still no leaves on the trees, and no that’s not why I took it. I took it because this is a Polar Ice Vodka add. No, I am not promoting this alcohol/partying. 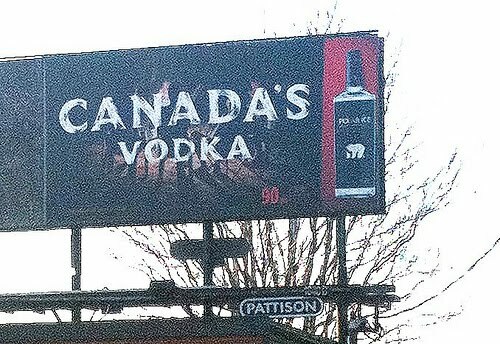 I took it specifically because the advertisement says, Canada’s Vodka. If this is Canada’s Vodka for a Polar Ice vodka advertisement, don’t you think someone would have clued into the fact that ice caps are allegedly melting away and polar bears are threatened to becoming extinct (see Polar Ice Vodka logo aka the Polar bear). I see this add as illogical, especially since the Polar Bears who are becoming extinct because ice caps are melting. This makes me ask only one question: Does this mean, polar ice vodka is becoming extinct, just like the ice caps and the polar bear? ← "This Is Indian Land"